A boy treated with foetal stem cells for a rare genetic disease has developed benign tumours, raising questions about the therapy's safety. The boy, now 17, received the stem cells in 2001 at a Moscow hospital and four years later scans showed brain and spinal tumours, PLoS Medicine reports. Israeli doctors removed the abnormal growth from his spine and tests suggest it sprouted from the stem cells. Critics say the finding is evidence against the controversial therapy. Apart from the ethics of using cells taken from embryos, opponents say there are big safety concerns. As well as the possibility that stem cells may turn cancerous, some researchers fear that it is possible that stem cell therapy could unwittingly pass viruses and other disease causing agents to people who receive cell transplants. Experts are hopeful that stem cells, which have the ability to develop into other kinds of human cells, will eventually lead to treatments for some of the most intractable conditions. The boy in question was treated for a condition called Ataxia Telangiectasia - a genetic disease that attacks the brain region controlling movement and speech. He received three courses of foetal stem cell injections to the brain and the fluid surrounding the spine. Four years after his first injection he was investigated for recurrent headaches and his doctors at the Sheba Medical Centre in Tel Aviv found two tumours - one in the spine and one in the brain at the same sites the injections had been given. A year later, when the boy was 14, the doctors removed the non-cancerous tumour from his spine and it was found to contain cells that could not have arisen from the patient's own tissue and had in all probability grown from the donated stem cells. Although they were unable to sample the growth in the boy's brain, the scientists believe this probably arose from the injected stem cells too. Donor-derived cells might have been able to spark tumours in this patient because people with Ataxia Telangiectasia often have a weakened immune system, say the researchers. It is not clear whether the stem cell therapy helped his genetic condition. They say the findings "do not imply that the research in stem cell therapeutics should be abandoned." Nonetheless, they say more work should be done to assess the safety of this therapy. Josephine Quintavalle of the public interest group Comment on Reproductive Ethics said: "The risks of tumour formation in association with embryonic stem cells are widely acknowledged and one reason why there are very serious concerns about the proposed use of such cells in treating spinal cord injury in the US. 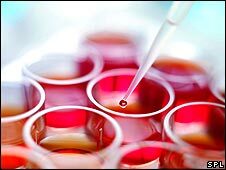 "It would appear from this report that foetal stem cells are similarly unstable. These are not areas of therapy we should be rushing into, whatever the ethical debates surrounding the use of embryo or foetal tissue per se." Stem cell scientist Dr Stephen Minger, of King's College London, said it was clear that the tumours had arisen from the transplanted cells. "This is worrying and we have to be cautious. We need to have long term monitoring and follow up of the patients given stem cells and rigorous regulation of centres providing cell therapy. "Although this is just one case it does show that we need to be careful about the cell populations we are using." He said not all clinics used good quality cells.